CREW WELFARE deliver connectivity in a way that works for owner and em- money at a scale necessary to meet seafarer demand. It’s simple ployee alike. What MLC has achieved is to raise the pro? le of economics and until the ‘disruptive innovators’ ? nd a way to the debate about what could and should be available. Beyond provide connectivity for free or very cheaply, the economics ap- this, MLC infers that crew welfare is central to a safe and pear to be stacked against, plentiful, low cost, high bandwidth pro? table organization. communications for crews. Or so you might have thought. Today, crews are becoming much more demanding about their need for access. 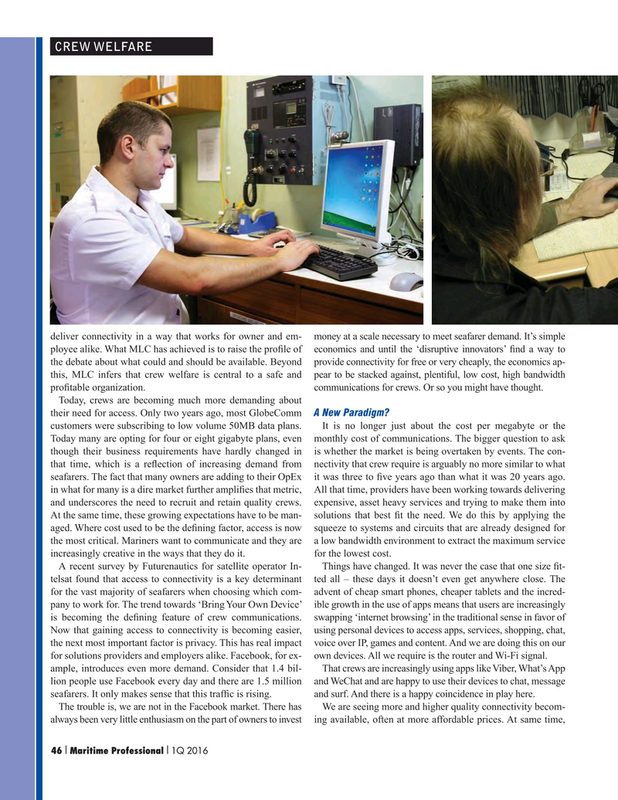 Only two years ago, most GlobeComm A New Paradigm? At the same time, these growing expectations have to be man- solutions that best ? t the need. We do this by applying the aged. Where cost used to be the de? ning factor, access is now squeeze to systems and circuits that are already designed for the most critical. Mariners want to communicate and they are a low bandwidth environment to extract the maximum service increasingly creative in the ways that they do it. for the lowest cost. Now that gaining access to connectivity is becoming easier, using personal devices to access apps, services, shopping, chat, the next most important factor is privacy. This has real impact voice over IP, games and content. And we are doing this on our for solutions providers and employers alike. Facebook, for ex- own devices. All we require is the router and Wi-Fi signal. ample, introduces even more demand. Consider that 1.4 bil- That crews are increasingly using apps like Viber, What’s App lion people use Facebook every day and there are 1.5 million and WeChat and are happy to use their devices to chat, message seafarers. It only makes sense that this traf? c is rising. and surf. And there is a happy coincidence in play here.